Velocity, temperature and salinity forecast are computed for the Mediterranean Sea and Black Sea system. the Dardanelles and the Bosphorus, where the resolution smoothly increases in the latitudinal and longitudinal directions, allowing for a maximum resolution of 1/250° (about 380 m). 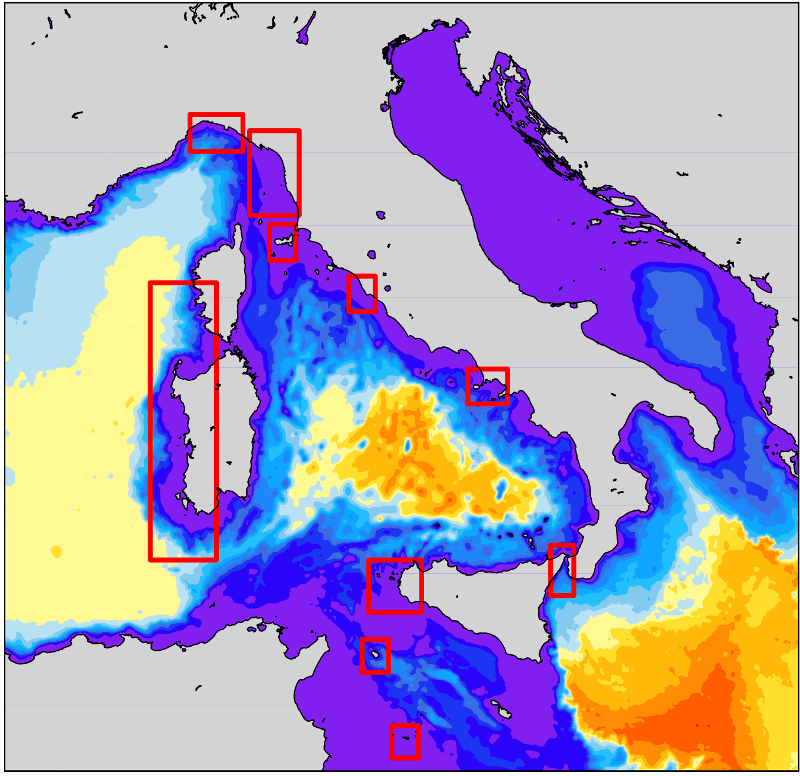 Significant wave height, mean wave period and wave energy forecast are computed over the whole Mediterranean Sea and ten sub-basins. The wave model WAM is used at a uniform spatial resolution of 1/32°, corresponding to about 3.6 km and delivers daily forecasts covering five days. Hourly maps are made available through the website. 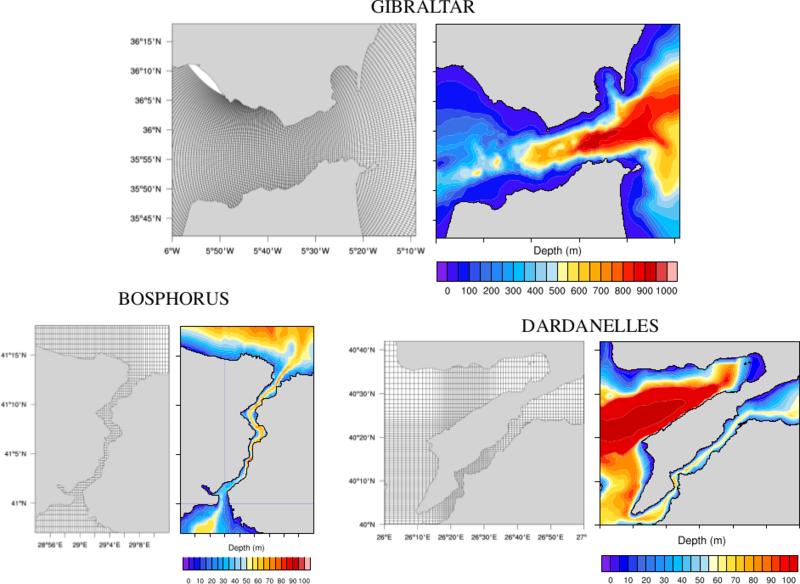 Higher resolution forecasts (resolution of 1/128°, about 900 m) are performed using the SWAN model, in the following areas around the Italian coast: Western Sardinia, Pantelleria Island, Lampedusa Island, Northwestern Sicily, Civitavecchia, Gulf of La Spezia, Elba Island, Gulf of Naples, Gulf of Genoa, Ligurian Sea and Messina Strait. The contents of this website are the property of ENEA (SSPT-MET-CLIM Lab) that manages them, in full discretion within the limits of the law, reserving the right to, freely and without notice, modify, suspend, or cancel the terms, conditions, or contents of this website. The operator ensures that this website has been designed and will be maintained, as far as possible using every reasonable method and appropriate tool, to ensure that the site functions accurately and continuously. However, the site operator cannot exclude that malfunctions and/or transmission problems may sometimes occur. agrees to not to claim ownership of the information contained within it. The operator retains all rights in relation to all information provided on or via this website (including all texts, graphics and logos). Use of the site is purely personal and not commercial (except in the event of legally agreed partnerships). It is, therefore, forbidden to copy, modify, upload, download, transmit, publish, or distribute to third parties, for commercial or other purposes, the content or trademarks of this website. The user may, purely for his/her own personal use, but never for business purposes, download texts or other information contained on this website and distribute them, provided that the source therein, is explicitly and clearly indicated. This website and the current regulations and conditions shall be governed by and construed in accordance with Italian Laws. In the event of any discrepancy or different interpretation of the various versions of these regulations and conditions, the version in Italian shall prevail.